Jeffrey C. Hall and 2 others are recognized for uncovering the workings of our 'biological clock' through the study of fruit flies. The fruit fly has been good to Jeffrey C. Hall. His landmark research, which helped crack the mystery of the body’s circadian rhythms and opened up new fields of study that linked disruptions in those rhythms with possible health problems, has been honored many times in biology and genetics circles. On Monday, Hall and two others – Michael Rosbash and Michael W. Young – received the highest accolade possible, the Nobel Prize in Physiology or Medicine. Hall and Rosbash conducted their research, dating to the early 1980s, at Brandeis University in Waltham, Massachusetts. Young conducted similar research at The Rockefeller University in New York. Although researchers had known about circadian rhythms, their collective work in isolating the so-called “period gene” changed the landscape and allowed understanding of how circadian rhythms adapt the workings of the body to different phases of the day, influencing sleep, behavior, hormone levels, body temperature and metabolism. The three will share the $1.1 million prize, although Hall said he doesn’t expect the money to alter his life in any way. After the announcement early Monday morning from Sweden, he fielded dozens of congratulatory phone calls from former colleagues and friends, but still had errands to run later in the day. “I’m not sure winning this prize means I don’t have to buy dog food,” he said. Now 72, Hall spends most of his time at his home in Cambridge, a small, rural town in Penobscot County west of Dexter where he has hundreds of acres of farmland that he allows others to use – either to grow corn or tap sugar maple trees. He lives alone, technically, but has seven dogs to keep him company. When he’s not with them, he’s riding one of several Harley Davidson motorcycles through the back roads of neighboring Piscataquis County. Hall mostly likes his rural lifestyle, although he misses the intellectual atmosphere of a college campus. “I’ve mostly lived in cities and this is very different,” he said. “It’s environmentally appealing and there are many nice people, but so many seem squeezed down in terms of their outlook on life. Hall was born in the New York City borough of Brooklyn and grew up in suburban Washington, D.C., according to a 2005 profile in the Proceedings of the Natural Academy of Sciences, an industry periodical. He attended Amherst College in Massachusetts in the early 1960s with the intention of completing medical school, but he abandoned that about halfway through his undergraduate studies to focus on genetics. At Amherst, he met researcher Philip Ives, who was studying fruit flies and became an early mentor. From there, Hall attended graduate school at the University of Washington in Seattle, which had a dedicated genetics department and a laboratory of Drosophila, the genus that includes fruit flies. Hall received his Ph.D. from the University of Washington as well and was recommended for post-doctoral work at the California Institute of Technology under Seymour Benzer, a renowned geneticist. Hall continued research in Benzer’s lab until 1974, when he took a faculty position at Brandeis University, where he stayed for more than three decades. Hall, who never married, said staying single gave him an advantage. Most of that work involved the fruit fly. Hall and Rosbash, who had been conducting separate but complementary research before they began collaborating, zeroed in on patterns of a mutated gene that revealed new information about circadian rhythms, sometimes referred to as the human biological clock. Essentially, they discovered that a protein encoded by the mutated gene accumulated during the night and degraded during daytime. Their original study of fruit flies was “able to peek inside our biological clock and elucidate its inner workings,” the Nobel citation said, and led to subsequent research connecting disruptions in circadian rhythms with health problems. That misalignment may be associated with diseases such as cancer and degenerative neurological conditions. Hall ended up in Maine by accident. Several years ago, former University of Maine biologist and researcher Harold “Dusty” Dowse did a sabbatical at Brandeis in Hall’s lab. The two were students together at Amherst College back in the 1960s and ended up in the same line of research. “I was doing more mathematical analysis; he was into the molecular biology,” Dowse said. Hall returned the favor and did a sabbatical at Dowse’s lab, and fell in love with the state. He ended up purchasing property not far from Dowse in Cambridge and taught for two years at the UMaine after his retirement from Brandeis in 2008. Dowse heard about the Nobel announcement from another former colleague and visited Hall on Monday. 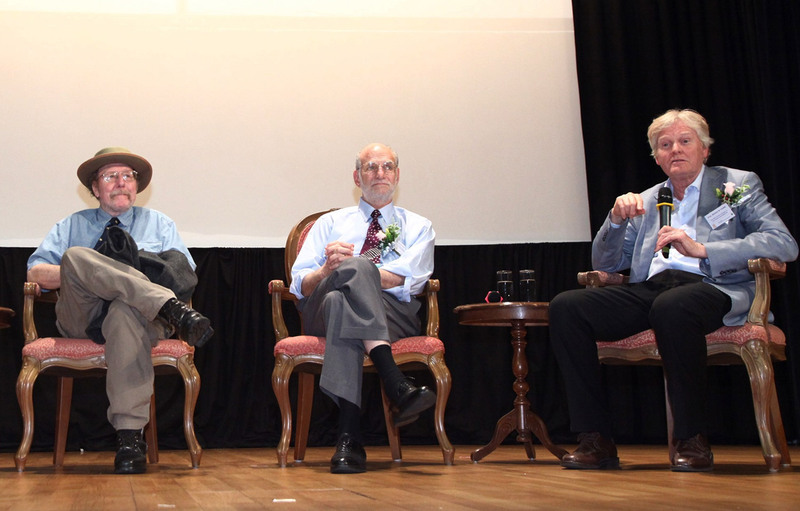 Hall explained that for researchers like himself and his colleagues, the Nobel Prize is often the culmination of years of other awards. “I think this is the sixth award that has come our way,” he said. Still, Hall said, to be honored for scientific research “at a time when much of the country has turned against science” is gratifying. He wryly noted that he was already awake when he received the call from Sweden about his Nobel in medicine because of changes in his circadian rhythm as he has grown older. “If you understand how the normal process works, that gives you a chance, not an inevitability, but a chance to influence the internal workings of the clock and possibly to improve a patient’s well-being,” he said.